In the words of one of Abba's less imaginative songs, Happy New Year. And as has become a new year tradition, I'll run down what's still to be achieved in the Merseytart project. I should also apologise for the lack of actual tarting activity the last couple of months. As regular readers (hello you!) will be aware, 2009 was marked by me suffering from depression, which tends to put a crimp on your day. It also makes you less inclined to go romping round the countryside pointing at train stations. I'm sorry I let you down, but as we enter 2010, I'm feeling a lot better, generally. Though I still have bad times, they're not as bad as they used to be, and I'm hoping to crack on and get on with the rest of the map. In addition, I'm no longer a wage slave, thanks to a handy voluntary redundancy payment, so I've got a lot more spare time to spend fannying around in the hinterlands. So: to the update. Remember that as time has gone on, more and more has been added to the plan, so while it looks pathetic for two and a half year's work, it's not. Trust me. 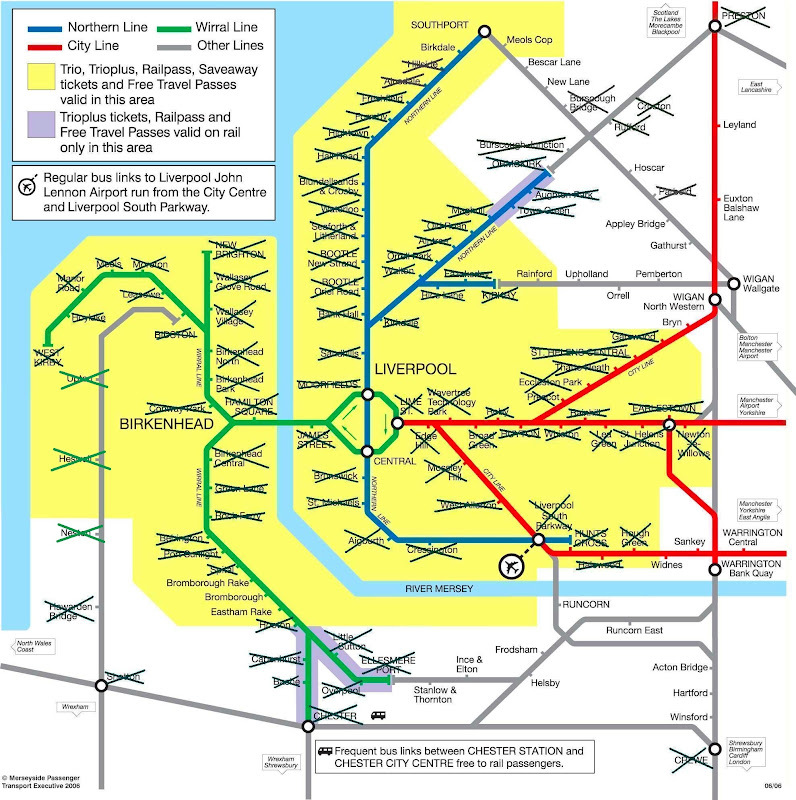 Wirral Line: Bromborough Rake, Bromborough, Eastham Rake (and see below). City Line (Wigan branch): Bryn. City Line (Warrington branch): Widnes, Sankey, Warrington Central. Kirkby to Wigan Line: Rainford, Upholland, Orrell, Pemberton, Wigan Wallgate. Southport to Wigan Line: Meols Cop, Bescar Lane, New Lane, Hoscar, Appley Bridge, Gathurst. 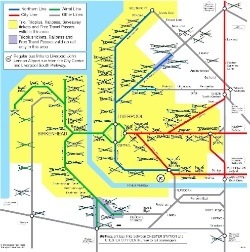 Helsby Line: Stanlow & Thornton, Ince & Elton, Helsby, Frodsham, Runcorn East. West Coast Main Line: Winsford, Hartford, Acton Bridge, Runcorn, Warrington Bank Quay, Wigan North Western, Euxton Balshaw Lane, Leyland. Blackpool Branch Line: Blackpool North, Poulton-Le-Fylde. Delamere Forest Line: Mouldsworth, Delamere, Cuddington, Hartford, Greenbank. And of course, there's the grand finale of the Loop waiting for me: James Street, Moorfields (Old Hall Street exit), Lime Street (low level) and Central to do as well, but that's a long way off. That's forty stations to go, plus the four city centre ones (which have been partially done but not completely). I reckon I've actually done about ninety (though I may have miscounted because I'm a bit thick) so we'll call that two thirds down, one third to go. When it's all written down it suddenly seems quite intimidating. Most of these stations are way out in the sticks, so it's an end to cushy wanders through suburban Liverpool; time for the OS maps and the compass, I think. In fact, I've only completed two entire lines - the Borderlands Line and the Preston-Ormskirk Line. It's sort of exciting though - a whole world out there, waiting to be conquered. I feel like Hitler, only without the moustache. Good luck with Bryn, it may well be your most boring tarting adventure yet. My childhood stomping ground is between St Helens Central and Garswood so I'm familiar with the end of the City Line. I'm kind of amazed that Bryn hasn't been closed, but it does perhaps remain somewhat useful for those who need to commute into St Helens or Liverpool, with the train connection to the former being particularly quicker than the bus alternative. It's adjacent to a bus stop which offers a better-than-every-ten-minute daytime service into Wigan (with the route passing both North Western and Wallgate for those who need to connect) so one would imagine that a train connection in this direction wouldn't be missed. I guess, though, that it might as well stop if there's a station there as it probably doesn't add much to the overall journey time, but it'll interesting to see if there are any implications for Bryn from the electrification plans. Merseytravel have no vested interest due to their rather over-zealous insistence that life does not exist beyond the PTE boundary (I still get annoyed at their bus timetables which contain the stops called 'beyond the county boundary' as though it is somehow obscene that one might wish to travel outside of Merseyside), but, equally, I can't imagine that Bryn is GMPTE'S top priority either! Somebody's beat me to it about Bryn. If there's a more soul-destroying station to visit in Britain, I've yet to see it. As Phil says, it's on a decent bus route, but when one thinks of the money that's been thrown at neighbouring Garswood by Merseytravel, it's shameful that GMPTE should ignore Bryn in such a shoddy way. I've always thought that GMPTE were never that keen on their rail network, and they must look at Merseyside's system (particularly the Northern and Wirral Lines) with a certain degree of envy? I have heard scurrilous rumours that GMPTE aren't too happy about the Wigan line getting electrified, as they feel that once Wiganers (Wiganites?) have a fast electric service into Liverpool the residents would rather go therefor work and play than head into Manchester. In the long term that could mean Wigan turning to Liverpool/Merseyside (as Halton Council - i.e. Runcorn and Widnes - already have) rather than the city on the Pennines. As you say Manchester has always seemed to have little regard for its rail services (though in fairness, they have a tram line to run, and their network is a lot more complex than Merseyrail). To be honest, Wigan is similar to St Helens in that it seems to function very much separately from its supposed urban focus. Growing up just outside St Helens, Liverpool was another world for me and we would very rarely make a trip into the city. The southeastern elements of Wigan borough may look somewhat towards Manchester (i.e. Atherton, Tyldesley etc. 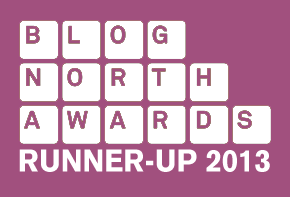 ), but my impression is that much of central and western Wigan would already feel slightly more affinity to Liverpool if pushed, notwithstanding my earlier comment that these places have a strong sense of their own identity which is separate from their city neighbours. I have a friend who is from St Helens, and he had a similar attitude to Liverpool. I suppose I come in as an outsider and I see the towns and villages of the area as intrinsically linked - not just through the Merseyrail map, though that's a visual clue - but also through things like accents, jobs, and so on. I tend to view Merseyside as a single entity, intertwined, while for people who grow up here it's quite different. The amount of Wirralians I've met who've denounced any link with Liverpool, or people from Southport who are proud that they go to Manchester rather than Liverpool to shop - I forget the prejudices and barriers that communities have built into them. I suspect Wigan doesn't want to be part of Liverpool or Manchester, thank you very much; but if it really had to, I could see it being a better fit - and more of a partner - with Liverpool. Confession: I have never been on a Manchester tram. I don't quite know how. I disapprove of them painting them yellow and silver, I know that.